The meetings Mr. Lincoln held with his Chicago advisers like Judd, Peck and Chicago Tribune editors Charles Ray and Joseph Medill were pivotal to the Senate campaign and his political career. Mr. Lincoln proposed asking Senator Douglas four questions at the Freeport debate – questions to which his advisors objected, according to some versions of the meetings. “‘Douglas will answer in some glittering generalities and Evade the question,’ said Peck – [Charles] Ray Et al,” Judd later told William H. Herndon. Mr. Lincoln insisted that Douglas would respond to the questions and it would eventually kill Douglas politically.3 As usual, Mr. Lincoln prevailed. 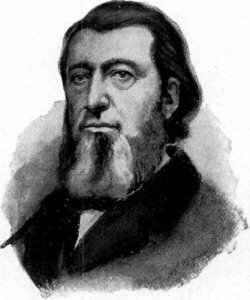 Ebenezer Peck served in the Illinois House of Representatives as a Democrat (1835-1836) where he was thorn in the side of the Whig Party. “The Democratic Party…was not really organized until Peck went down there. He was fresh from Canada and we used to call him Canada Peck – he wore a fur cap with a long tail hanging down behind,” recalled John Todd Stuart, who was then the Whig leader. “He went down there and organized caucuses, and urged the party in all parts of the state to hold conventions. In all this he was doing a good thing by his party, but the Clay men did not like it, because after he had done all this we found we could not carry our measures as we had done before.”4 In 1842 when Whigs and Democrats faced off in a debate over state bank policy, Ebenezer Peck and State Auditor James Shields represented the Democrats. The Whigs were represented by Mr. Lincoln’s friends Edward D. Baker and Anson G. Henry. The meeting took place in the middle of the publication of the “Rebecca” letters in the Sangamo Journal that satirized Shields and nearly led to a duel between Shields and Mr. Lincoln. Biographer Isaac Arnold wrote that Peck went to the White House in the summer of 1864 and told Mr. Lincoln: “Your reelection is necessary to save the Union, and no man must stand in the way of that success. Mr. [Montgomery] Blair himself will gladly retire to strengthen the ticket.”9 Later that summer, Postmaster General Blair was indeed forced out. I received yours yesterday and this morning I had an interview with the President in relation to its contents; with every desire on his part to comply with your request in the premises; he does not deem it compatible to do so. The favorable results of the recent elections, might subject him to the imputation of being willing now, to disregard the desires of the radical men, who have so reluctantly come in to his support, and thus subject him to the imputation of catering to new element[s] in disregard of their opinion. He stated during the conversation, that a prominent and sensible radical, had stated to him in a conversation upon this subject; and had while he (the radical) might afford to make the hazard of such a declaration as you desire, that the President could not. Mr. L. spoke very kindly of you expressing his full confidence in your integrity of purpose, and intentions — he could not under advice, in the present juncture of affairs, do what you, and I might add, he desired. I asked him if he could say that if any state in rebellion, Georgia for instance would cease hostilities, elect her senators and representatives, and then ask to be recognized as a state of the Union; to enjoy her full rights and immunities as such (now obstante slavery) in all respects, as before the rebellion, he would be for recognizing such state, and restore the people thereof, as if no difficulties had intervened; he said, although there would be no hesitation on his part so to say and act, if the fact should so be, and the event should occur, yet he did not feel justified so to avow in advance especially where so many imputations would rest upon a declaration, having the appearance of propitiating votes, from men who are not cordial, in support of his general administration. “Thanksgiving day — Genl Singleton called this morning. Told me he had just come from Canada where he had had an interview with Clay & Tucker, the Rebel Commissioners, and was here to see the President in regard to negotiations for peace — that the aforesaid rebels were anxious for peace upon the basis of the union, and though the people of the seceded states would return if an amnesty was offered, and slavery let alone. I said I thought the President would make the abolition of slavery a condition precedent to any settlement. He replied that he knew he would not — that he had a long interview with him before the election — that the President showed him all the correspondence between himself and [Horace] Greel[e]y preceding ‘To whom it may concern,’ and said that ‘To whom it may concern’ put him in a false position — that he did not mean to make the abolition of slavery a condition, and that after the election he would be willing to grant peace with an amnesty, and restoration of the union, leaving slavery to abide the decisions of judicial tribunals — and that now the election was over he was again to see him upon the subject, and would let me know the result of the interview. He also showed me a letter from Judge Peck to himself giving an account of a conversation he had had with the President as ‘go between’ for Singleton. Roy P. Basler, editor, The Collected Works of Abraham Lincoln, First Supplement, p. 32-33 (Letter to Ebenezer Peck, August 23, 1858). Michael Burlingame, editor, An Oral History of Abraham Lincoln, John G. Nicolay’s Interviews and Essays, p. 45 (Conversation with Norman B. Judd, February 28, 1876). Douglas L. Wilson and Rodney O. Davis, editor, Herndon’s Informants, p. 723 (William H. Herndon interview with Norman B. Judd, October 2, 1890). Michael Burlingame, editor, An Oral History of Abraham Lincoln, John G. Nicolay’s Interviews and Essays, p. 13 (Conversation with John Todd Stuart, June 24, 1875). Abraham Lincoln Papers at the Library of Congress. Transcribed and Annotated by the Lincoln Studies Center, Knox College, Galesburg, Illinois (Letter from Salmon P. Chase to Abraham Lincoln, August 25, 1862). Jesse W. Weik, The Real Lincoln: A Portrait, p. 309. Michael Burlingame and John R. Turner Ettlinger, editor, Inside Lincoln’s White House: The Complete Civil War Diary of John Hay, p. 134 (December 28, 1863). Michael Burlingame, Abraham Lincoln: A Life, Volume II, p. 87. Isaac N. Arnold, The Life of Abraham Lincoln, p. 390-391. Harry E. Pratt, Concerning Mr. Lincoln, p. 112-114 (Letter from Ebenezer Peck to James W. Singleton, October 14, 1864). Theodore Calvin Pease and James G. Randall, editors, The Diary of Orville Hickman Browning, Volume I, 1850-1864, p. 694 (November 24, 1864). Edward R. Magie, Stenographer, “Memorial of Judge Ebenezer Peck,” 1881, p. 40.